Extra Judicial Killing: ‘Robber’ killed in ‘gunfight’ at Daulatdia of Rajbari district. ‘Robber’ killed in ‘gunfight’ at Daulatdia of Rajbari district. 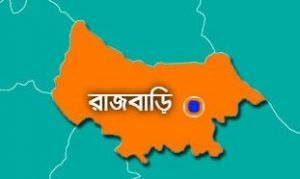 By Bangladesh Media; An alleged robber was killed in a gunfight with police in Daulatdia ghat area of the upazila early Monday. The deceased was identified as Arshad Bepari, 30, son of Saijuddin Bepari, a resident of Uttar Daulatdia of the upazila. According to police he was accused in seven cases, including murder and robbery cases, filed with Goalando Police Station. Police in a drive arrested Arshad from the area on Sunday night when he was taking preparation for committing a robbery. Based on information gleaned from him during the primary interrogation, police conducted another drive near by-pass road area around 1.30 am for recovering arms, said Shah Jalal, Officer-in-charge of Goalondo Police Station. Police said that sensing the presence of police, Arshad’s cohorts opened fire at them, prompting them to retaliate, triggering a gunfight, which left Arshad critically injured. Police informed that Arshad died on the way to hospital.